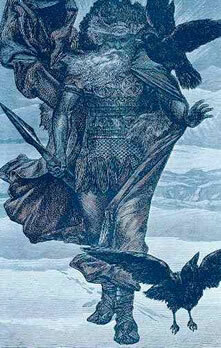 WE regard Odin as the most important of our gods. For this reason, whatever one thinks of when meditating or pondering on the gods and goddesses and their differing powers, each aspect of that power is part of the great Allfather. What is peculiar and interesting about Odin is that he is one and many. He is like the mind itself, in which there can be dark thoughts and light thoughts and thoughts toward war as toward peace. There can be those of creative art and there can be the negative attributes of chaos and destruction. All these, are reflections of the human mind, counterbalanced by ideas on one side of positive idealism and on the other by negative idealism. Man is not separate from his gods for he is in divine link through blood, spirit and being. Surely this must be a more realistic picture of a force which is at the back of creation. All these elements are bound together in proportion within a spiritual force which plans and orders things. Odin comes close to being how things really are. We do shout for joy on some occasions as we weep on others. We live one moment in time and then are taken away the next and this is how Odin is. He is the great power that everything comes from and to which everything returns. When he is spoken of in our holy books he is always spoken of as mind, as thought, as inspiration, as something which one cannot touch and cannot feel. But through one’s own capacity to receive inspiration it is possible to touch and feel the end results of thought. As a god of inspiration and action who sought knowledge he sacrificed a single eye. By way of shamanistic ritual he hung suspended from the World Tree, Yggdrasil, and thereby discovered the secret of the runes. He grasped in a symbolic language the pattern of all these different thoughts and thereby reduced all the great events in the universe down to their carved symbols of that particular activity. These symbols then blended into a runic set combination explaining creation. The most satisfactory way to approach a god of the spirit is to go on the path towards spirit: to love the use of the word, to love music, to love anything which is inspired. If we in our lives can share some of this then we shall surely know Odin. When we do something well, when we write well, talk well, even fight well, whatever we do that has passion and is inspired, it has the handiwork of Odin in it. Planning, skill, craft and mind power, in all this we can know him, for he represents that point of light that all creation comes from, for he is the Oddr. If, therefore, one wishes to know Odin then the need is to discover what is without, what is outside in life, on the land, in the wood or the brook, in space and beyond, for it is also within. The power that comes from the oddr is deep within and in the greater aspect of the folk soul. All have that innate spark, the ability to commune with the point of creation. What then of the Christian god? The Eastern concept is that one and all must humbly submit and cower before a supreme and ultimate will in fear or be damned in defiance. One must follow in blind faith and without question, be one of a flock of sheep, to regard a god as the beneficial shepherd. But Odin, god of the North, does not want spiritual slaves. He is for heroes, for the doers of deeds and of actions. O3in’s folk stand proud and noble, without mental chains. He shuns those who skulk and those who would plead f or divine favour. Because he is leader among the gods he expects men and women to be great, to model themselves upon the Odinic archetype and live by example. This at the end of the day can only be done through the use of gifts which are beyond the rational, beyond logical procedure, whereby it involves the senses of the deeper unconscious levels of the mind, that which is just as real, just as vital as everyday events that happen and occur in the mind. Odin is able to stir these deep ancient waters and to move people. But ultimately action rests with the individual. Upon the ship of life one can sail well, steer it straight and in the right direction, knowing that the god of our folk is always there. From out of the past, into the present and forward toward the future the Oddr, the high god Odin Allfather will always be, for he has always been.